At some time prior to that summer, dial telephones were installed in the Ashdown rooms. Ashdown had once been a residential hotel, and most of the rooms were parts of suites consisting of rooms A, B, and C, accessible from a small entryway off the main hall. The manual telephone had been located in the entryway and had been shared amongst the three rooms. When the dial phones were installed, the C room got a private line, but the A and B rooms got party lines wired from the original wiring that had served the entryway phone. The theory was that the A and B rooms were unlikely to want to call each other. The ringing was individual, as the A room rang from “tip” to ground and the B room rang from “ring” to ground. Unfortunately, the ground wire connections were rather fragile, and often broke. The result was that both phones would ring when either was called. The graduate students were much more gentle with their phones than the undergrads, but they complained much more loudly (and to more important people) when there was a service problem. As I recall, the telephones used in Ashdown were Western Electric model 302's. A telephone of that type is shown in the photo, although I believe the telephone shown was the East Campus desk "house phone". One of the fellows on my floor, Bob Schildkraut, was somehow involved with the telephone installation, or knew the people who were. So, that summer, I got a job with the Dormitory Telephone System. 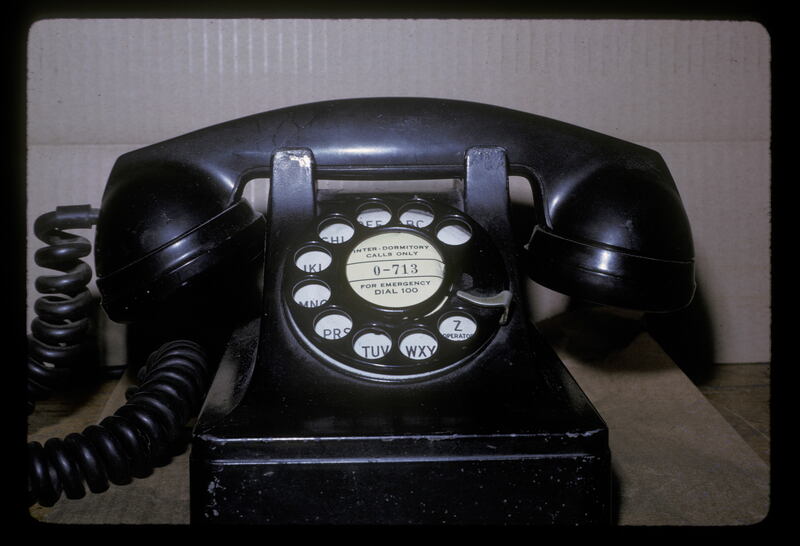 During that summer of 1962, we installed dial telephones in all of the East Campus / Senior House rooms. In general, the wiring for the already extant manual telephone was used. However, the manual phones had been installed on the wall just inside the doorways of each room, so additional wiring was installed to bring the dial telephones over to the desks. In the “East Parallel” (Walcott, Bemis, and Goodale), this meant stapling a wire on the baseboard or chair rail all the way from the entry door to the desk. However, in the “West Parallel” (Munroe, Hayden, and Wood) our supervisor, George Broderick (Fred’s son), discovered the remnants of an old radio system that included two conduits from the desk area to the closet. One contained electrical wiring, and the other contained old twisted pair telephone wire. Since the closet was near the door, all we had to do was run a short length of wire into the closet where we could connect to the telephone wire that ran over to the desk. This saved considerable work and considerable wire. George’s reward for his ingenuity was that we pulled the electrical wire out of the other conduit and gave it to him. He took it all to his Beacon Hill apartment, where he burned the insulation off in his fireplace and sold the copper to a scrap dealer. Since the switching equipment was not yet ready, the students used the telephones as manual sets during the 1962-1963 academic year.